The damaged WWII RAF Banff Strike Wing Memorial at Boyndie, between Portsoy and Banff. 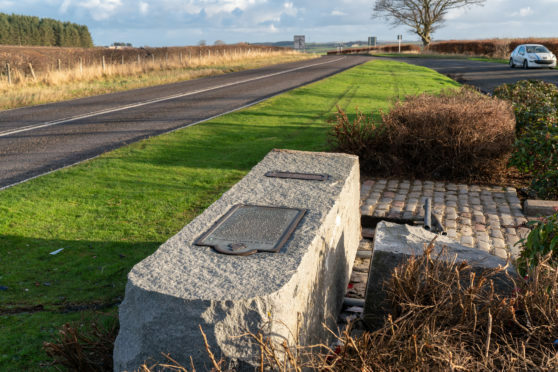 A man has been charged after a roadside memorial dedicated to heroic airmen was knocked down. 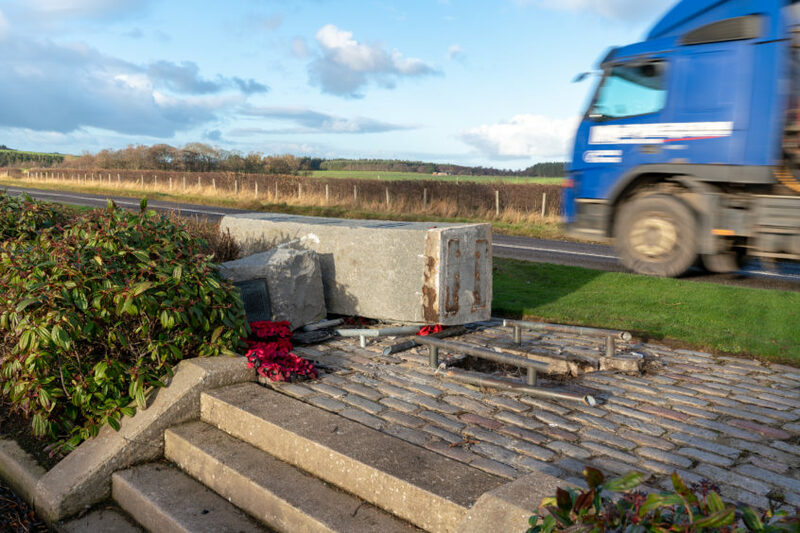 The RAF Banff Strike Wing Memorial, which sits just yards away from the A98 Banff to Portsoy road, was hit early on Sunday. The giant granite block was ripped out of its foundations, landing on its side among the poppy wreaths laid for Armistice last month. The RAF Banff Strike Wing Memorial at Boyndie. Last night, police revealed a 29-year-old man has been charged with alleged drink-driving offences. The memorial was erected almost 30 years ago to mark the contribution made by a multinational air unit during World War II. The airmen were based at Boyndie, near Banff, which was used to launch attacks on enemy shipping off the Norwegian coast during the conflict. William Hossack, was one of the original trustees of the Banff Memorial Trust and worked to get it erected in 1989. He drove up to the spot to see the damage for himself yesterday, and said it was “terrible” to see it lying at the side of the road. “I heard it had been knocked down and decided to come and have a look myself. Geoff Dyer regularly drives by the granite memorial, and stopped in shock when he spotted it yesterday. He said: “When you think about what it is there for and to see something like is soul destroying. Banff councillor John Cox hopes the memorial can be restored and given a new lease of life. He said: “It is very symbolic for the history of the aerodrome, where a lot of men working during WWII.